“Third Chopstick” by Yin Xiuzhen, Song ErRui, and Song Dong. 2013. During the installation of Chopsticks III at Chambers Fine Art in New York in 2011, 8-year-old Song ErRui approached her parents, Song Dong and Yin Xiuzhen, and expressed her interest in joining their artistic collaboration. Up until that point, The Way of Chopsticks had been a project exclusively between Song Dong and Yin Xiuzhen. It was a meditation on married life and family designed to maintain complete artistic autonomy for both of the artists involved. Chopsticks serve as a metaphor for two equal individuals coming together to form something greater. The concept shatters with a third chopstick, but they were still intrigued by their daughter’s offer. After considering the idea for some time, they decided to give it a try for their next exhibition. For The Way of Chopsticks at the Philadelphia Art Alliance, each of the three family members made a chopstick for the group called Third Chopstick. It offers three distinct points of view with each insight being compounded by the next. Taken together, the three pieces offer an impressively complex view of contemporary family life. For her chopstick, Yin Xiuzhen, chose to depict a dizi, which is a traditional Chinese flute. The dizi, typically made of bamboo, was commonly used in Chinese folk music and was traditionally associated with the common people. 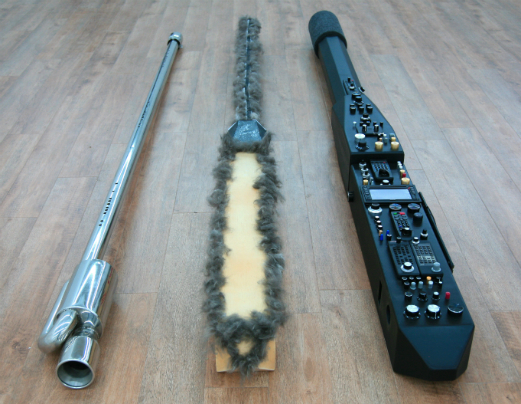 The dizi Yin Xiuzhen has made is long, thin and made of chrome with a tail pipe and a muffler attached to each end, a reference to the well-known smog crisis in Beijing, which perhaps implies that the music produced by this instrument will be toxic. The piece simultaneously evokes a beautiful and humble tradition rooted in nature and the noxious environmental consequences of expansion and wealth in contemporary China. While praising the beauty of Chinese culture, Yin Xiuzhen is also criticizing the present conditions, for fear of what her daughter and her daughter’s generation may lose in the future. Song Dong’s chopstick reflects his interest in fake electronics, which, while making reference to the pervasive presence of cheap knock-off products in Chinese society, also reveals his affinity for good-natured trickery. The chopstick has, at first glance, the appearance of a complicated high-tech device. However, upon closer examination, it becomes hilariously implausible as a functioning object. 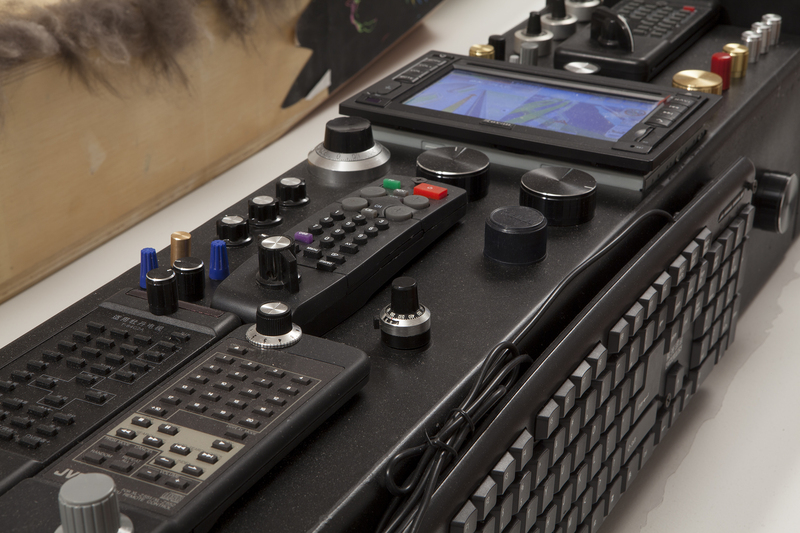 It is covered in useless knobs and old remote controls, and there is a keyboard simply tacked onto the side. There is, however, a functioning GPS device that periodically blurts out directions. Song Dong has expressed that this sculpture was made to represent his attitude toward his daughter, whom he wishes to control, but cannot. Since all of the devices are incorrect and useless, he has endowed her with a GPS so she can at least always find her way home. Song ErRui modeled her chopstick after a wolf. 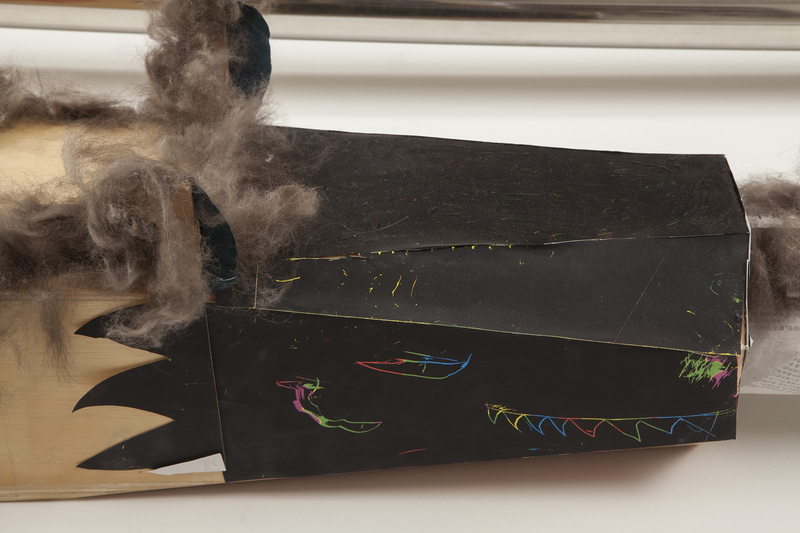 She saved the hair from her shedding dogs to create two bands of fur running the length of the sculpture. There are ears attached and drawn-on eyes and teeth. The sculpture essentially takes the form of an elongated wolf head. Her fascination with wolves is quite sophisticated for an 11-year-old. She identifies with wolves because they are inherently social creatures, however, as the only child of parents who both come from large families, she feels like a lone wolf. This idea can be extrapolated to the issue of the One Child policy currently in place in China. After millennia of a society based on social and communal principles, the fundamental structure of the culture is being forcibly changed by the state. Suddenly, there is a nation of individuals, and perhaps individualists. 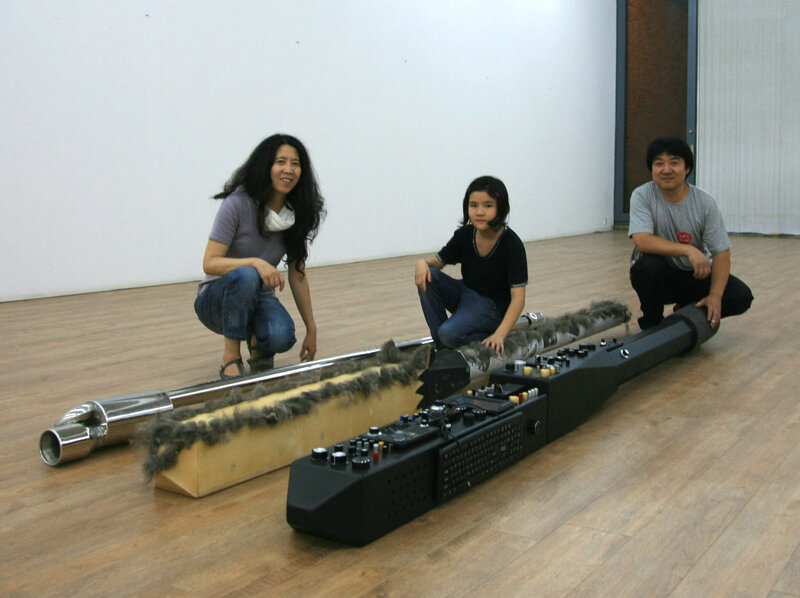 The Song family with their respective chopsticks for the piece “Third Chopstick” 2013. While the idea of a third chopstick may shatter the surface level metaphor presented by The Way of Chopsticks, in practice, adding another dimension expands the scope of the project exponentially. Once each chopstick is understood, they can then be understood in relation to one another, thus deepening the meaning. Yin Xiuzhen and Song Dong are commenting on Chinese society, but they are also concerned about their daughter. At the same time, you hear their daughter’s concerns, her own interpretation of society, and her view of the future. In addition, the structure of three chopsticks is maybe a more perfect resemblance of the asymmetry found in real life; when you open a drawer, you do not find your utensils neatly paired. Song Dong and Yin Xiuzhen’s dynamic as a pair was permanently altered with the addition of their daughter. Song ErRui brings a welcome and enriching change to their art as well. The Way of Chopsticks is on view at The Philadelphia Art Alliance September 12 – December 29, 2013. The Way of Chopsticks: Song Dong ＋Yin Xiuzhen is represented by Chambers Fine Art in New York City and Beijing. Writer, curator, and Director of Ullens Center for Contemporary art in Beijing Philip Tinari gave a talk on Beijing’s 798 Art District, one of the most interesting and vibrant in Contemporary Art. He spoke at The Philadelphia Art Alliance on October 3, 2013. Stories are told through many different media, including visual art and performance. Through multimedia artwork, including sculptures and video, “The Way of Chopsticks,” an installation project by Song Dong and Yin Xiuzhen on view now through December 29th at the PAA, tells tales of post-revolutionary China with a focus on the family and the home. This exhibition also raises questions regarding the role of traditions in all cultures. Families can experience this exhibition and learn more about Chinese art and culture during our Saturday Family Workshops, the first of which will be this weekend! Join us this Saturday, October 5, 2013, from 10-11:30AM for The Art of Shadow Puppets. Artist, performer, and educator Hua Hua Zhang will teach families about the Chinese tradition of shadow puppetry and will demonstrate how to make a shadow puppet of your own! The admission fee is $10 per child for general admission and $5 for members. Parents and guardians enter free and must accompany the child. For more information and to register, click here. Shadow puppetry is a traditional Chinese art form that combines visual art, performance, and even music, to present stories. The art of shadow puppetry originated in the Han Dynasty and continues today, as artists are finding new and inventive ways to keep this ancient tradition alive. The Philadelphia Art Alliance is thrilled to welcome one such artist, Hua Hua Zhang, for the first of our Saturday Family Workshops this weekend. We hope you will join us to learn more about traditional art form, make a shadow puppet, practice performing, and take your puppet home as well! 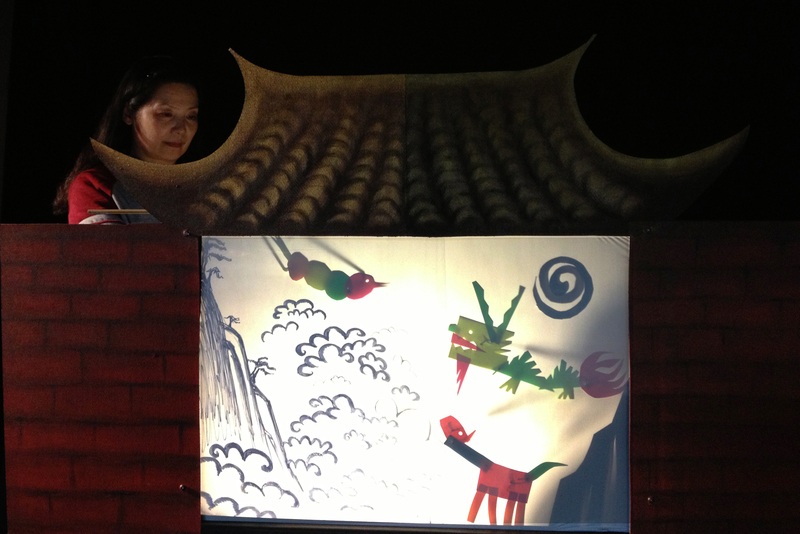 The Art of Shadow Puppets with Hua Hua Zhang will be the first in a series of Saturday Family Workshops at the PAA. Click here to read more about the program. Categories: Craft, programs | Permalink.